One of my favorite places to shop is....an Asian grocery store. I love H Mart, but I really love the new Great Wall that opened on Rt 40 in Catonsville. While I dabble in Korean, Japanese, and Thai food at home, my real favorite (both to eat and to cook) is Chinese, and Great Wall (as in the Great Wall of China) stocks a nice selection of ingredients more familiar to Chinese cuisine. They also have a bar at which one can purchase hot foods, including whole roasted ducks, chickens, and roast pork. We've purchased the roast duck twice so far. For $20, one gets a whole duck, neatly chopped into pieces. Both times, I've frozen half the duck to enjoy another time. It reheats really well spread out on a foil-lined baking sheet and popped in a 350°F oven for 30 minutes or so. The last time we bought a duck, I asked for it to be cut only in half. One half went into the freezer, and the other half was stripped of its meat. (While chopping a duck into umpteen pieces with a cleaver seems like a good idea, every damn piece has a bone in it, which gets annoying after a while.) 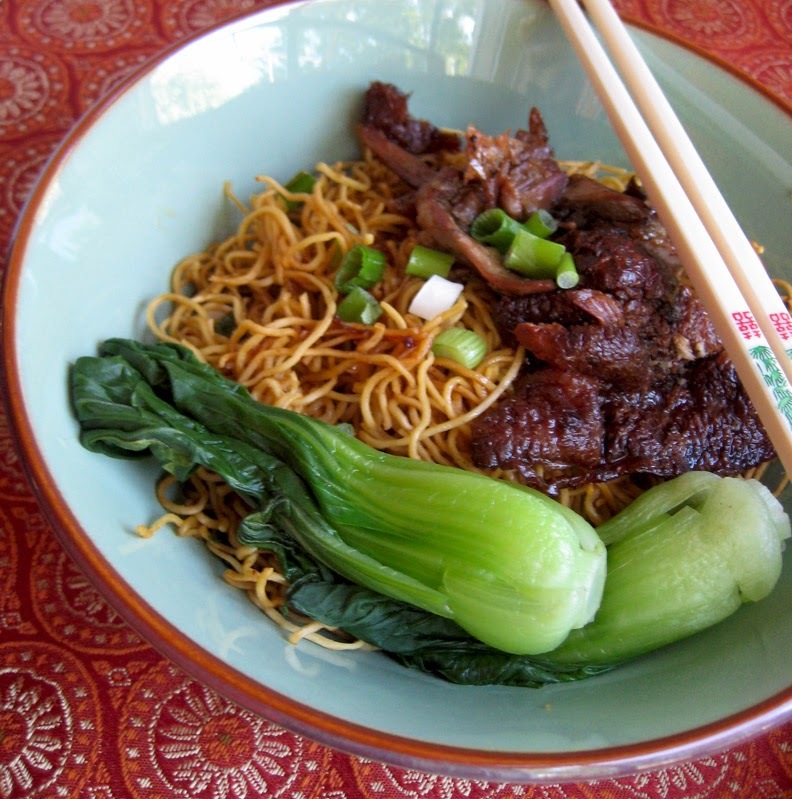 I put the meat into the oven to crisp up the skin and served it with steamed baby bok choy and fried noodles, both also purchased at Great Wall. I had never seen the pre-packaged, pre-fried, noodles before. The instructions on the bag say to put the noodles in a pan, add a little water, and cook until the desired crispness. Rather than adding plain water, I added soy, sugar, and sesame oil as well, to make a dish not unlike the soy sauce noodles we enjoy at dim sum. With the duck and the bok choy, dinner was tasty and pretty, too. Combine the first 6 ingredients in a bowl, stirring well to dissolve the sugar. Heat a large skillet over high heat and add the noodles. Pour over the sauce and mix into the noodles quickly (I used two forks). Turn down the heat to medium and continue stirring the noodles to coat with sauce. They should start to crisp up in a few minutes...and stick to the bottom of the pan. Give them a taste to make sure the noodles don't taste raw, then toss in the scallions. Turn off the heat and serve immediately.